Indulge in our most popular facial yet! You will receive complete facial cleansing, toning, exfoliation with steam. Hand & arm massage along with a 10 min facial massage. Also included is one of our tailor made special serum infused using galvanic current, plus a mask of your choice. This is the "now you see them now you don't" facial. Similar to the Princess facial, but more concentrated on black/white head removal. Special antiseptic device included. Secrets out! Plump up them cheeks with our fabulous collagen mask. Includes mini spa facial. Anti-oxidant, helps prevent wrinkles, brightens the skin, repairs damaged skin cells. Includes mini spa facial. 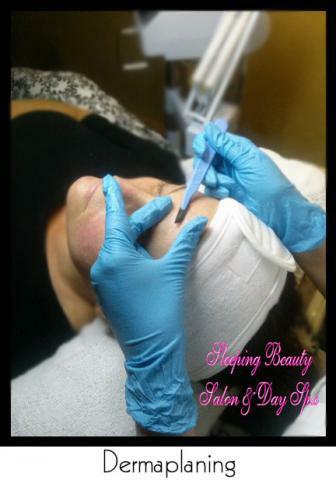 Experience the benefits of Dermaplaning. - Does not cause broken capillaries for people with thin skin. - Clean procedure, NO mess! - Gets rid of vellus hair, leaving your skin so soft & bright. - Helps product penetrate the skin on a deeper level. - Works great on prepping the skin before a chemical peel. Whether you like the fluffy side of facials or require more intense treatments such as our cellular level chemical peels, we got you covered! Our PCA line has so many products to offer for all skin types from Fitzpatrick 1-6. Our peels are "Self Neutralizing" and do not need to be rinsed off or neutralized. Please remember that optimum results are based upon regular treatments and maintenance. Just like exercising, 1 workout doesn't make you fit, consistency is the key. Remember that optimum results are achieved through consistency & diet.